Description: Local C728 heads over to RR Donnelley & Sons for some switching. Description: laying over at Curtis Yard (Pine Junction). Description: Eastbound through Pine Junction. 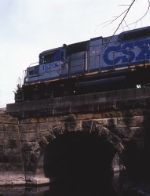 Description: CSX GP15T 1520 in an earlier CSX paint job. Notice the number board on the conductor's side, looks like the "2" is a diffrent font. Description: CSX GP15T #1520 in the very strange April Fool's Day consist of Q516. Note the TORC SD40 trailing the 1520. Description: 8153's cab is smashed on the opposite side.